ONE of the coldest winters on record is forecast this year but it has not deterred Dundrum woman Eileen Byrne from getting her head shaved. 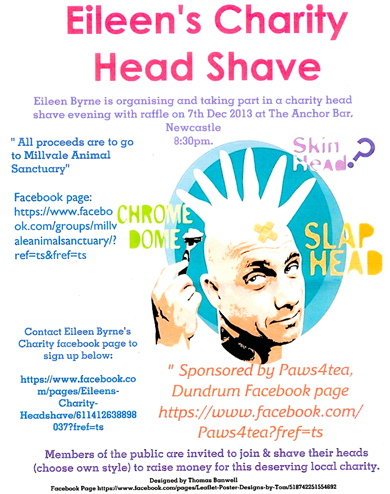 Eileen has organised a charity head shave in the Anchor Bar in Newcastle on Saturday 7 December in support of Millvale Animal Sanctuary near Castlewellan. Hair today – gone tomorrow. 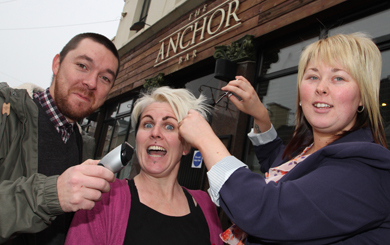 Rob Manley, owner of the Anchor Bar in Newcastle, with Eileen Byrne who is having her head shaved by hairstylist Emma Travers of CV Hair Design in Dundrum for Millvale Animal. Sanctuary. And she has invited anyone else who is brave enough to join in for the worthy cause. She said: “This is the first time I’ve done anything like this. My family and friends have been a great support. I’ve fundraised for charities before such as St Baldrick’s children’s cancer charity and taken part in leg waxing, but a head shave is a much more serious commitment. 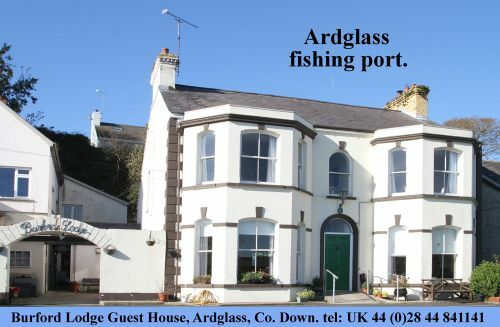 And in the winter too! “The volunteers behind Millvale Animal Sanctuary do a fantastic job giving their time and energy to support animals in need. Animal welfare is an issue that we often forget about while we are engaged with other matters in life. “I am looking forward to the fun on the night but it is daunting losing your hair. It’s such a big part of who we are. And just to think that we lose up to forty five percent of our body heat if you are bald!” Eileen gulped. “I will have a big woollen hat at the ready. “Emma Travers from CV Hair Design in Dundrum is doing the head shave for me so I’m in good hands. I think she will be using a cutthroat razor at some stage so I hope I am not shaking! Sharon Quinn who owns and manages the Millvale animal rescue centre said: “One of our key aims is to save unwanted dogs from the pounds ensuring they are not destroyed and sending them on to the Dog’s Trust in England. I have a no-kill policy and every animal is treated with respect. “The sanctuary looks after strays, and people have even dumped boxes of kittens at the front door. Altogether at Millvale there are seven donkeys, four horses and I have two pet cows that are 26 years old… they will soon be the oldest cows in Northern Ireland I think. But people arrive too with all sorts of animals and some birds. I’ve looked after hedgehogs, and even a swan. “Basically the old home I lived in has been converted as a place for the dogs to live in and I now live in a new bungalow close by. The dogs sleep there on old sofas and chairs comfortably and end their days in peace and some comfort. The door is open at all times in the house which has 8-9 rooms.There are quite a lot of old dogs there that are quite settled in their ways at Millvale. At times I could have as many as sixty dogs there. Sharon also added that the animals at Millvale are well looked after and that Rathfriland Veterinary Clinic had been a great help. Sharon is certainly saying ‘Dogs are not for Christmas’. See Millvale Animal Sanctuary on Facebook. Check out Eileen’s Charity Headshave on Facebook.